West Ham midfielder Cheikhou Kouyate has signed a new contract with the club until the end of the 2020-21 season. Kouyate, 26, joined the Hammers from Anderlecht in 2014 and has made 63 appearances, scoring eight goals. 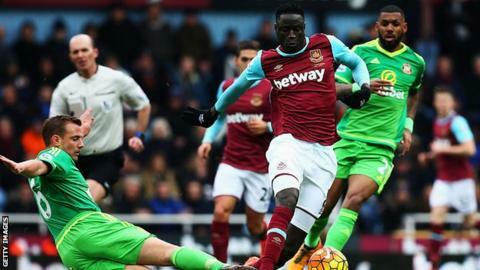 "There is a lot of work for me still to do and I need to continue working hard," Kouyate told the club's website. West Ham are currently fifth in the Premier League, two points off a Champions League place, and move to the Olympic Stadium next season.